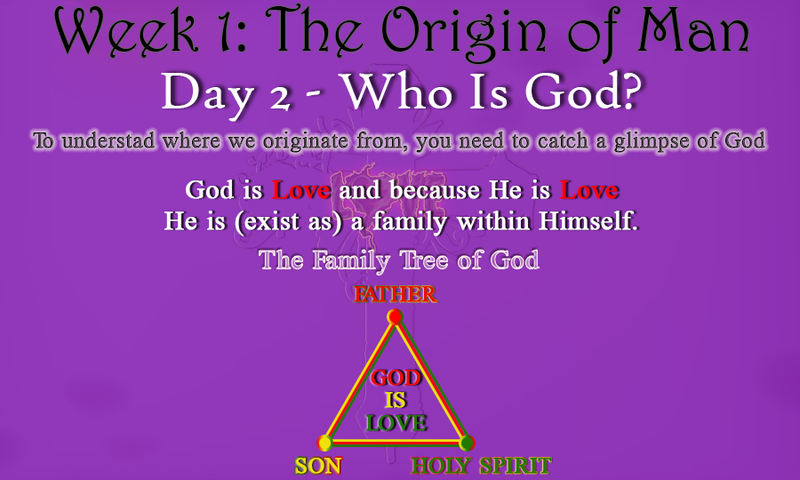 Week 1, Day 2 – Who Is God? Many waters cannot quench love, nor can rivers drown it. A young man once went on a quest to find from the scriptures the reason and purpose God had for creating human beings; after months of research, none of the verses he found in the Bible that implies why God created man satisfied his longing. So he turned to God and God in His mercy gave him a glimpse of Himself (why He is What He is) to show Him why He made Man (humanity). Though the young man came out this experience baffled and unable to grasp what he saw; Some truths about God became clear. God is Love, and love cannot be love unless there are “objects” for love to express the nature of itself to (i.e. to love). Before there was anything; before angels, the devil and even heaven; there was God. And because He is love there were objects (beings) for Him to express the nature of Himself to (i.e. give love to). These “objects” (beings) were Himself or what we termed as the Godhead (Trinity). 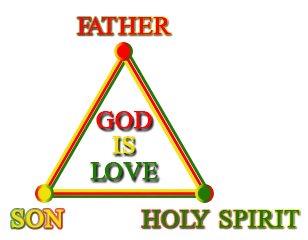 Within the One, God exists three distinct beings (Father, Son and Holy Spirit) and He exists as these beings because of love. From eternity past before any created thing came into existence; God had been sharing the nature of Himself with Himself (i.e. giving and receiving love to & from Himself). And, Oh what pleasure and delight He took in doing this. The Father looks at the Son and sees the reflection of perfection, beauty and glory of Himself and pours out Himself unto Him in infinite joy and pleasure. The Son looks at the Father and sees the infinite worth of Himself; the completeness and unparalleled splendor of glory and majesty of Himself and gives Loves back. The Father and the Son looks at the Holy Spirit and sees the infinite power & wisdom of His being; the delight of His heart and the very essence of grace and love of Himself and lavishes Himself unto Him. He is Who He is; He is complete within Himself. This is Love; God is Love and because of that He exist as a family. SELAH. Side Note: How do you describe the indescribable? ; How do you describe the uncreated when all you are and knows are created things. What would you say if I tell you to describe to me what Panaclate is? That’s exactly my point. This was the overwhelming task of the prophets of Old when they encountered God. The only way to tell their experience is to use what they’re already familiar with (i.e. created things on the earth) to describe something/someone that’s unlike anything in creation. God is unlike anyone or anything in creation but yet to make himself known to us created things are needed to help express His being and nature. Today, take some time to prayerfully think about God (i.e. the idea of Him being Love); and since He knows how you are uniquely framed ask Him to reveal Himself to you in way that will help you know Him more. Father, we humbly come before you admitting that we cannot know you unless you make yourself known to us. Jesus, we ask you through the Holy Spirit to take the glorious nature of yourself and make it known to us. For to know you is to know what love is and also what it isn’t. Holy Spirit show us who God truly is that we may not create our own ideas of Him. For you truly are unfathomable. To this, we ask in Jesus name. Amen.